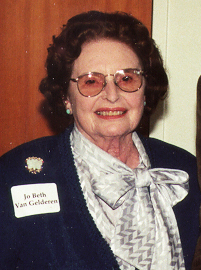 For more than 25 years, Dr. Jo Beth Van Gelderen has encouraged donations to the History Associates Fellowships by means of an annual challenge whereby she matches other contributions dollar-for-dollar. In 2006, she established the History Associates Graduate Endowment to provide a stable source of funding for graduate students in the UCSB History department. The earnings from this endowment fund fellowships and other forms of graduate student support.